Posted at 11:05 am by Yummytums! What’s better than chocolate? Cacao nibs mixed with kale! Well, to be honest, this combination is not really better than chocolate. But it is good and it’s definitely good for you. If you like the extra burst of energy that you get from eating chocolate, you should definitely try cacao nibs. They’re not as sweet as chocolate, since they don’t contain sugar, but they do have a chocolately and slightly nutty taste and they’re quite good for you. Cacao nibs are basically cacao beans that have been roasted and separated from their husks. They’re packed with magnesium, dietary fiber, iron and antioxidants. And they make a great addition to green smoothies. You can buy organic cacao nibs at health food stores and many groceries. You can also order them online. I ordered mine from Amazon. A bag lasts a long time; I’ve probably been using the same bag of cacao nibs for six months. 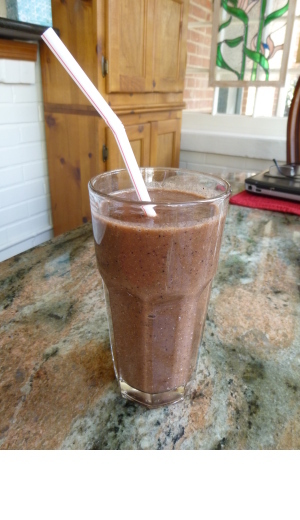 This smoothie is one that I enjoy for breakfast because the addition of cacao nibs gives me a little jolt of energy. The nibs contain a substance called theobromine, which is a central nervous system stimulant similar to caffeine. They also contain tryptophan, which is said to help produce serotonin and enhance your mood. That’s not a bad way to start the day, right? Of course, you can’t have a green smoothie without the greens. And you can use either spinach or kale in this smoothie. Spinach has a milder taste, but kale is also a good choice. Kale has been called one of the world’s healthiest foods, or the “queen of the greens.” It belongs to the Brassica family that includes cruciferous vegetables such as cabbage, broccoli and Brussels sprouts. Just one cup of this powerhouse green provides more than your daily nutritional value of vitamins A, C and K. And it does all of this with very few calories, which is another plus in my book. Of course, you can’t go wrong with spinach, either. So use whichever you have on hand. Roughly chop the carrot. If it’s organic, you don’t have to peel it, just wash it well. Add the carrot, spinach or kale, cacao nibs, blueberries, banana, honey and water to a high speed blender. You can also add a cup of ice if your fruits are fresh or if you like your smoothies on the thicker side. Mix for 30 seconds or until you reach the consistency you desire. 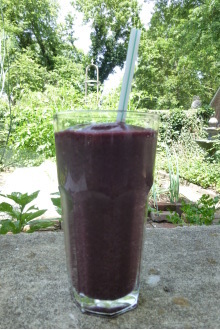 This smoothie is a beautiful purple color because of the blueberries and nibs. The carrot, banana and honey tend to mask any slight bitterness of the cacao nibs, but if you like your smoothies sweeter, just add a little more honey. Posted at 6:36 pm by Yummytums! This smoothie is a great way to start your morning on a healthy note. You can’t find fault with the ingredients; they’re full of vitamins, fiber and phytochemicals, which are substances found in plant-based foods. The American Cancer Society reports that some phytochemicals act as antioxidants or have hormone-like effects on the body that may help inhibit some types of cancer. Best of all, though, the smoothie tastes great. I’m a big believer in using good nutrition to stave off illnesses and to help maintain a healthy body and weight. So I’ve always been interested in the health benefits of particular foods. In this smoothie, you get a little bit of a lot of different nutrients. The apple contains vitamin C and is rich in fiber, but be sure not to peel it because a lot of the fiber and almost all of the antioxidants are actually in the peel. For this reason, I recommend buying organic apples to avoid the pesticides sprayed on the conventional varieties. If you do buy conventional, be sure to wash it thoroughly before you use it. 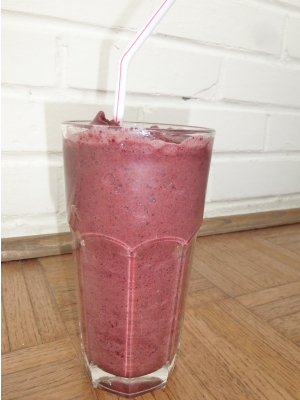 You can use fresh or frozen blueberries in this smoothie, whatever you have on hand. I tend to buy frozen ones when they’re on sale or fresh when they’re in season and a bit cheaper. Again, organic is the best way to go with blueberries. 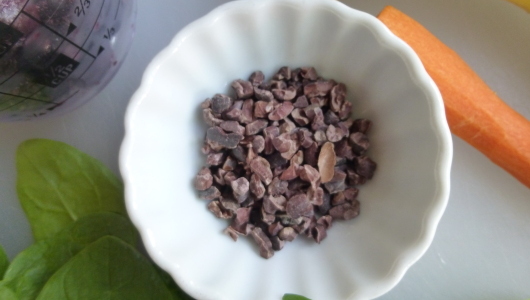 The cacao nibs are basically raw chocolate and are also a source of antioxidants. They’re crunchy on their own and a little bit bitter, but they work really well in smoothies. To make this Breakfast Filler Green Smoothie, simply add all of the ingredients into a high-speed blender. You’ll need a high speed blender in order to completely grind the cacao nibs and apple peel. I use a Vitamix, an appliance that I purchased about a year ago and have never regretted. They are a bit pricey, but I use mine almost every day. So the cost has been worth it to me. The water should go in first, with the frozen ingredients being added last. Blend together and enjoy! If you like your smoothie on the sweeter side, you can always add a little Stevia or some honey.